Google Talk's gadget was a nice addition, but you couldn't use it to chat with unknown people or with the visitors of the site, like in Meebo Me. Now you can do that using the new chatback badges. You only need to add some code to your site and anyone could click on the generated badge to chat with you. The conversations are private and only one-to-one, so other visitors won't be able to read them. For some strange reason, they're not even added in Gmail's chat section. Unfortunately, being constantly interrupted by other people is not very pleasant, so you can disable the link from your badge by setting your status to "busy" or by signing out of Google Talk. I have been trying to find out if it is possible to style the talk gadget to match your site. I know it's an iframe but there was some way of doing it for the regular chat box with a linked xml file. No luck so far. Anyone know if it possible? I still don't understand why you would add that gadget to a site. If I want to chat with my contacts, I have other options. Regarding the customizations, Google offers a way to link to a CSS file, but there's a problem: "the domain from which your custom CSS file is served must also be hosting a properly-configured crossdomain.xml file at the root level. This file allows the Google Talk Gadget to load data (your custom CSS file) from your domain." This is almost cool, but is there not a way of getting the vistor when he initiates a conversation on my blog to forward to my Gtalk, rather than having me to be logged into iGoogle? Is there maybe a bot for it? I will spread it in my language too. This need just one improvment: internationalization. I cant change the status message, even if my GTalk is in other language. > would add that gadget to a site. > contacts, I have other options. I think it's just a *Really Easy* way to do it - copy paste a little code & you're done. This badge is useful because you can chat with the owner of a site, but embedding the gadget into your site is pointless. Glad to know it's not just me... I'm getting that error, too. I'm almost tempted to fire up Safari or IE to see if Google's accidentally done something that breaks in Firefox. Pretty neat. I can use it with my gmail user id but is there a way to use it with my google apps id and therfore domain name? Wow, this functionality is great - instant communication available to any visitor, but it still maintains anonymity. I have gone ahead and put this one my page, but haven't figured out if my crossdomain.xml is working in an attempt to style the bubble. My basic css file is just trying to change the background of the bubble (class ".b" - thanks firebug), but no luck yet. Joey: I wondered this and then decided it didn't matter, as they never see your identity, other than your nickname (which you can change). The biggest downside I can see is that this doesn't send the messages straight to your IM of choice, but rather sends a message to your IM app telling you that someone has left a message and gives you a link to the gadget with the guest already waiting for you. So instead of just replying, they must wait for you to receive their question, click the link, wait for the page to open and reply. It's a bit round-about. Well... I've spent almost half my sleep time just to shrink that enormous 200x60 bubble to fit in my site. if you change "w=200" for "w=###", the bubble will have a ### pixels width. The same goes for h=60 and the height. Thanks a lot! It works for apps too! Great! I enjoy it and I was searching something like this one... I'm very happy for this gadget. Awesome new feature! Although it uses an iframe, I have already added it to my blog. Too bad the width cannot be edited. But they will certainly make that possible. Nice functionality. But when I already logged-in in a client, why it is giving a link and upon clicking that, it is opening a new window. After that, if I minimize the window, it is not giving any notifications when a new message comes. Is it not possible to see all the messages by the site visitors in my client only? 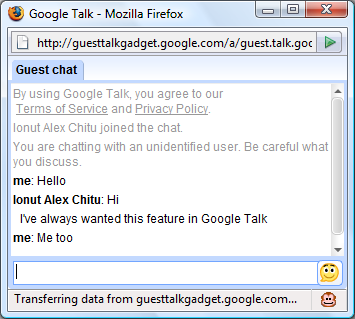 Google Talk's desktop client doesn't support this feature (chatting with anonymous users), so you get a link to a special version of the Google Talk gadget. You might want to play with http://www.hab.la it's a free alternative to google's chat back. And is really customizable, although admittedly no one has really pushed it's customizing features to the edge. That link was: Hab.la - funny blogger -- no auto-highlighting. The Google chatback badge is kinda neat, but it definitely is behind the times in terms of functionality and easy-of-use. The series of pop-ups and windows you get when someone initiates a conversation from the web is annoying. Both Hab.la and Digsby offer plug-ins for your site that are much nicer. Well, I think it doesn't work since I tried clicking on it but nothing happened! how to change online status circle to other picture? Can you put the standard version in a "Google Site"? I've been messing with this for a couple days. I think the fact that my librarians (which is how we'll use this as a reference service) have to click on so many links just to activate the chat will be a project killer. "Google Talk's desktop client doesn't support this feature (chatting with anonymous users), so you get a link to a special version of the Google Talk gadget." It's not just the desktop client. It does this in Meebo, too, which is what we use to aggregate about 5 different IM accounts. i'm offline...but why badge still online? Is it possible to have a "Chat room"? Whitout me beeing logged in, just visitors talking to eachother. And yes, group chat, not only one-to-one? Just like many people above, I also get 404 error now. It was working perfectly fine until today evening, and I didn't change any darn thing. I tried some "solutions" by disabling old badges and then creating a new one, but that didn't work either. Time to get the old-styled C-box, unless somebody solves this. It was great as long as it lasted. Thanks! the chat badge has the same problem in my website, 404 error. I tried to create a new badge, disabled all old badge, tried all the browsers, with the updated flash, clearing cookies but still no luck. Will this be fixed at all? Has anyone seen a response from Google on this? I am getting the same 404 error message. Why is their no way to notify google of problems other the help forums? dosn't work ! " 404 page error "
a big problem . any one from usa can call them about that . I'm getting the 404 error as well. I use the chatback badge on my wordpress site for customer service. It work fine for about 3 months, now it's a no-go. Someone from Google said: "We are aware of this problem. An emergency fix is being pushed to resolve it." > "We are aware of this problem. > An emergency fix is being pushed to resolve it." Three questions: when? when? when? If you have a Gtalk or any Instant Message client account you can use Hab.la live chat. They are a free service, with minimal branding / no ads on the chat widget, and it works great. Does anyone know of anything like this from google that you can put on a webpage and allow multiple people to chat in? More of a chatroom type application? Thanks in advance! A FriendFeed group could be used, but isn't from google. Lively was an embeddable graphical(3d) chat room by google, but ended up shut down. Yes, you can try FriendConnect's conversation gadget. I just tried google chat gadget on one of my website and it worked fine. Find below are some of the links that might help. but problem is nw most of the times if am online also ,showing am Offline...!? am tired of it plzz help me?????? I would not like to show the box when user is not able to chat, so is it posible to take status value or something to make it works like that? I don't understand it... I do have the gTalk client installed, but when I get an incoming chat, it opens in my Gmail account... Then why do I have the client installed? Click here to join: http://......."
Hi, I would also like to use google talk chatback in mobile... please do provide support, especially with android phones. thanks!!! How can i integrate my website with gtalk? "Google Talk chatback badges are no longer being developed and some users may experience issues with utilizing them. We recommend removing any implementation of the badges you may have added." I have same problem: "When I type a message in the chat window, I get the same message replied to me"
Same problem Come to with me. if any body have the solution please mail me on my id "devender.saini.bias@gmail.com"
I cant even Get this to work. I add the little conversation bubble, but when i click on it this takes me to a new blank window. The same here! :( Blank popup window. Seems they stop working on that thing. Hey i ve use the Same Code as said bt the popup window does not opens the Chat window it redirected to Support Page????? why dat so?? Yeah, same issue. This feature used to work before. I've tested it about two years ago. WHY IN THE WORLD THEY DISCONTINUED IT!!! I used it on my websites. It's unfortunate that this was discontinued, the workaround that I am using is to sign up for a live chat ( http://www.clickdesk.com/ ) and hook it up with Gtalk. Visitors use the live chat interface, I use the Gtalk interface. This sounds PERFECT for what i want to use it for. Is there any free alternative that i can put on my website to chat to visitors from my gmail chat gadget? Does any one know? Plz let me know how to resolve this.....?? The charter statement of this website (located in the upper right of this page) reads: An unofficial blog that watches Google's attempts to move your operating system online. How bad will it have to get before all you people wake up, and see what's happening? George Orwell saw it all, and you people just wont wake up! We need competition from the open source community to stop these Plutocrats and Federalists before there is a freaking camera up everybody's arse!